Every Monday PaperTake comes out with a new weekly challenge. This week's challenge is to use HOT colours (reds, oranges, yellows, hot pinks etc!). 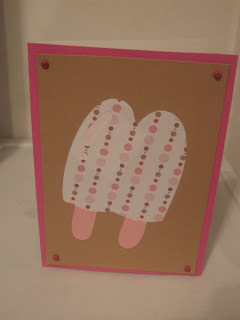 The first card is the card that I made for the challenge then I got on a roll and couldn't stop making Popsicle cards, I have one more to make, these will make great summer birthday cards. The Popsicle is from the cricut doodlecharms cartridge (I love that cartridge). Mmmmmhhh yummy. They are fabulous. Love them. Yumm!! What a fab card - love it! How cute!! I love the doodlecharms cart! 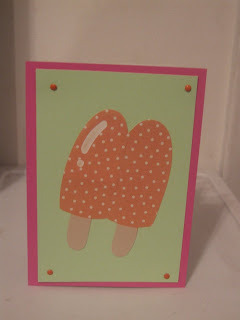 I love the idea of using these for summer birthdays, fab cards.